Hey y’all I’m Susanne and I blog over at New South Charm and I’m so excited to be here at Tornadough Alli sharing this great dish! At my house we love everything taco; from regular tacos to Chicken Taco Soup and don’t forget the Taco Casserole! 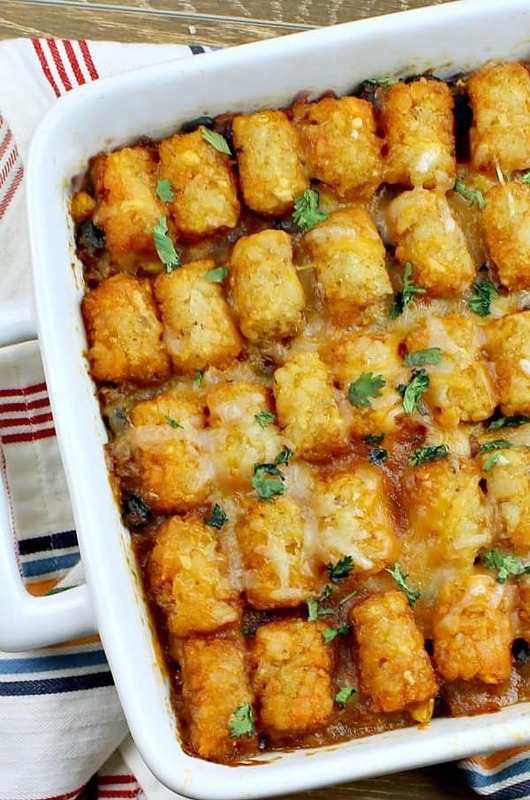 So, how could we not love this recipe for Taco Tater Tot Casserole? Turns out we LOVED it, big time!! 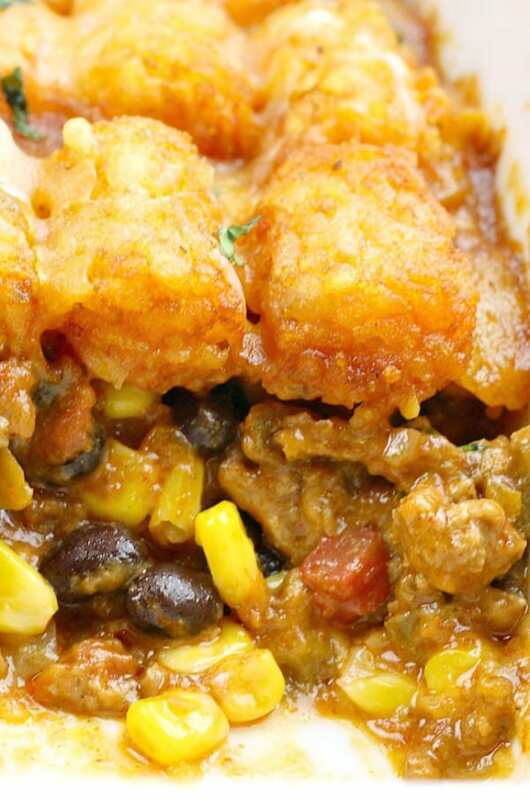 This delicious Taco Tater Tot Casserole is packed with corn, tomatoes, black beans, beef and lots of gooey cheese! Plus, it’s topped with rows of crispy tater tots! How can this recipe not be a winner? 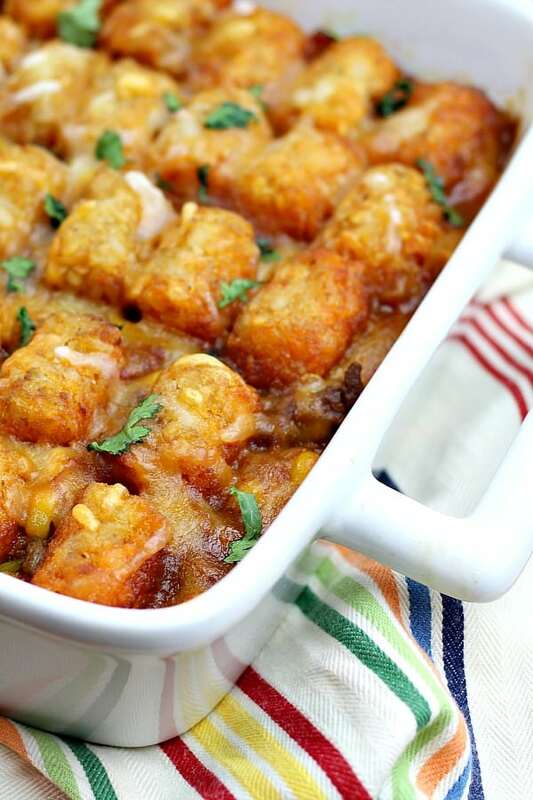 Tater tot casseroles are actually really easy to make and this one is no exception. Start by adding cooking onions, bell peppers and ground beef in a large skillet until beef is no longer pink and then onions are tender. Next, add the taco seasoning, enchilada sauce, tomatoes and chilies, corn and black beans to skillet and cook for a few minutes. Then, stir part of the cheese and stir until melted. 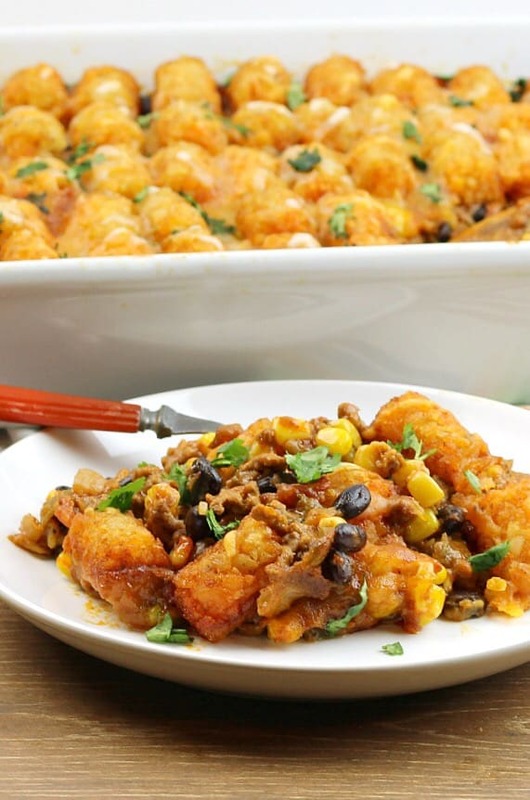 Transfer the beef mixture into a casserole dish and line frozen tater tots over the top. Place in a 375 degree oven for about 30 minutes. At the end of the baking time sprinkle with more cheese and then pop it back in the oven for five minutes to melt the cheese. Serve this dish hot and garnish with cilantro or sour cream. That’s all there is to it, easy peasy, fast and easy! I hope you’ll give it a try and you’ll love it as much as we did!! In a large skillet over medium heat cook onions and bell pepper until tender. Then add the brown beef unit cooked and no longer pink then drain fat and return to skillet. Combine taco seasoning, tomatoes and chilies, enchilada sauce, black beans and frozen corn to skillet and cook for 10 minutes. Transfer beef mixture into the casserole dish. 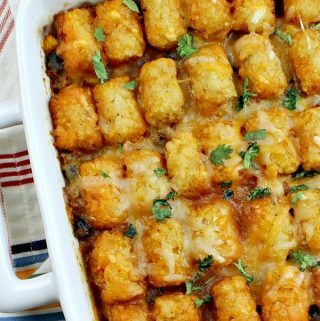 Line tater tots across the top and bake for 30-35 minutes. Remove from oven and sprinkle the remaining cup of cheese over the top. Bake another 5 minutes or until cheese is melted and bubbly. Garnish with cilantro and sour cream if desired.